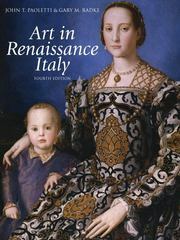 Art in Renaissance Italy 4 Edition Art mattered in the Renaissance... People expected painting, sculpture, architecture, and other forms of visual art to have a meaningful effect on their lives,” write the authors of this introduction to Italian Renaissance art. A glance at the pages of Art in Renaissance Italy shows at once its freshness and breadth of approach, which includes thorough explanation into how and why works of art, buildings, prints, and other forms of visual production came to be. The authors also discuss how men and women of the Renaissance regarded art and artists, why works of Renaissance art look the way they do, and what this means to us. Unlike other books on the subject, this one covers not only Florence and Rome, but also Venice and the Veneto, Assisi, Siena, Milan, Pavia, Padua, Mantua, Verona, Ferrara, Urbino, and Naples—each governed in a distinctly different manner, every one with individual, political, and social structures that inevitably affected artistic styles. Spanning more than three centuries, the narrative brings to life the rich tapestry of Italian Renaissance society and the art that is its enduring legacy. Throughout, special features, including textual sources from the period and descriptions of social rituals, evoke and document the people and places of this dynamic age.